This volume focuses on current issues of debate in the area of modern macroeconomics and money, written from (a broadly interpreted) post Keynesian perspective. 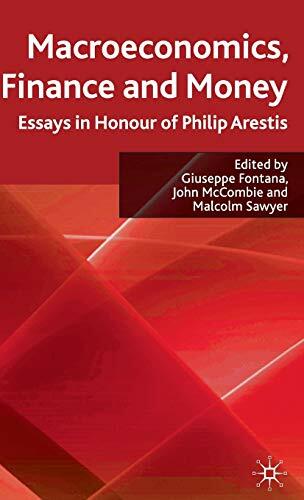 The papers connect with Philip Arestis' contributions to macroeconomics and money, and pay tribute to his distinguished career. GIUSEPPE FONTANA is Professor of Monetary Economics at the University of Leeds, UK and Associate Professor at the University of Sannio, Italy. He has recently been awarded the first G.L.S. Shackle Prize, St. Edmund's College, University of Cambridge, UK. He is a Research Associate at the Levy Economics Institute (Bard College, USA), a Visiting Research Professor at the Center for Full Employment and Price Stability (University of Missouri Kansas City, USA), and the Cambridge Centre for Economic and Public Policy (University of Cambridge, UK). JOHN MCCOMBIE is Director of the Centre for Economic and Public Policy and Fellow in Economics, Downing College, University of Cambridge, UK. He has previously held positions in Economics departments at the University of Hull and the University of Melbourne. His research interests include the study of national and regional growth disparities, economic growth and the balance-of-payments constraint, and criticisms of the aggregate production function and conventional measures of the rate of technical progress. He has published widely in these areas. MALCOLM SAWYER is Professor of Economics, Leeds University Business School, University of Leeds, UK. He was until recently Pro-Dean for Learning and Teaching for the Faculty of Business, University of Leeds, UK. He is managing editor of International Review of Applied Economics and on the editorial board of a range of journals. He has published widely in the areas of post Keynesian and Kaleckian economics, industrial economics and the UK economy. He has authored 11 books and edited 18, has published over 70 papers in refereed journals and contributed chapters over 100 books.